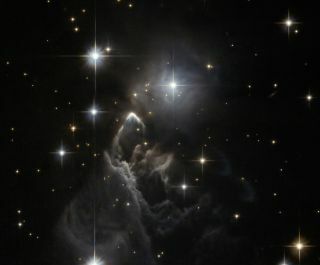 The ghost-like nebula, IRAS 05437+2502, includes a small star-forming region filled with dark dust that was first noted in images taken by the IRAS satellite in infrared light in 1983. This recently released image from the Hubble Space Telescope shows many new details, but has not uncovered a clear cause of the bright sharp arc. A ghost-likenebula billowing out from a nest of bright stars and dark dust takes centerstage in an impressive new image from the Hubble Space Telescope. Manydetails about this stellar nurseryremain unknown, other than its location in the constellation Taurus (the Bull), close to the central plane of our Milky Way galaxy. Thenebula contains a small star-forming region, but what is most eye-catching, is a bright upside-down "V"that defines the upper edge of the floating mountain of interstellar dust. Researchersare unsure of what lights up this boomerang-shaped feature, and the nebulaitself has not been studied in detail. Thefaint IRAS 05437+2502 nebula was first discovered in 1983 by the InfraredAstronomical Satellite (IRAS), which was the first space telescope to scan theentire sky in the infrared wavelength. Thisnew image was taken with the Wide Field Channel of the Advanced Camera forSurveys aboard the Hubble Space Telescope.